The Pew Research Center’s Global Attitudes Project recent report on Muslims values towards extremism which was based on its face-to-face interviews conducted in 11 countries makes for interesting analysis. 822 Malaysians participated in the survey. 522 of them identified themselves as Muslim. When asked whether violence such as suicide bombing is justified to defend Islam from its enemies, 5% of the Malaysian Muslims surveyed said it is ‘often justified’, 22% said ‘sometimes justified’, 12% said it is ‘rarely justified’, 58% said it is ‘never justified’, while 3% indicated that they did not know or refuse to answer. 867,395 Malaysian Muslims think that violence such as suicide bombing is ‘often justified’ to defend Islam from its enemies. 3,816,538 Malaysian Muslims think that violence such as suicide bombing is ‘sometimes justified’ to defend Islam from its enemies. 2,081,748 Malaysian Muslims think that violence such as suicide bombing is ‘rarely justified’ to defend Islam from its enemies. 10,061,782 Malaysian Muslims think that violence such as suicide bombing is ‘never justified’ to defend Islam from its enemies. 520,437 Malaysian Muslims do not know or refuse to answer the question. There are at least 3 important observations to be made from the above propositions. Kurzman likened this to the popular cultural icon of Che Guevara, “For decades, left-leaning American and European youths have taped Che posters to their dorm-room walls without lifting a finger to overthrow capitalism.” Likewise, Muslims’ inclination towards the justification of violence in defence of Islam does not necessarily lead them into extremist activity. Third, this report highlights the urgency for Muslims to re-look into the rhetoric of “enemies of Islam” used arbitrarily by members belonging to right wing ethno and religio centric groups such as UMNO and Perkasa. If violence is perceived as justifiable to defend Islam from its enemies, then there is a serious cause for Muslims to discern over the criteria required for one to be categorised as such. The on-going controversy over the word ‘Allah’ is a good example; should Christians be categorised as ‘enemies of Islam’ simply because they use the word ‘Allah’ in their religious observation? The highest Islamic authority in Malaysia, the Department of Islamic Development (JAKIM), certainly thinks so, as seen in their disseminated Friday sermon dated 30 August 2013 in which Christians are called ‘musuh Islam’ (Malay: ‘Enemy of Islam’). One of the reasons JAKIM persistently forbids Christians from using the word ‘Allah’ is due to the allegation that such usage places Allah as one of three gods. [viii] This is another manifestation of UMNO-linked organisations’ flirting with extremism and their lack of discernment when it comes to other religions such as the concept of Christian Trinity. 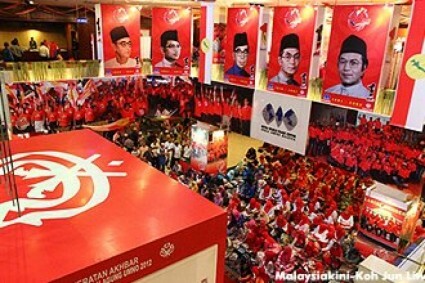 It is urgent for Malaysian Muslims to be circumspect over the criteria required to categorise one as enemy of Islam and not to be manipulated by antagonistic rhetoric thrown around in the public and cyber space by extremists and also for the international community to continue treating UMNO as a secular party. In any case, it is also not difficult for any discerning person to notice the racist and extremist-inclined policies administered by UMNO and its affiliated groups such as JAKIM as being itself anti-Islam. Although on occasions, a limited number of non-Muslims may have misconducted themselves before Islam; yet this is often due to their ignorance fed by local quasi-extremists who are allowed by UMNO to freely roam and roar around the country or merely exercising their rights within a democratic framework. Nonetheless non-Muslims’ misapprehension is categorically distinct from these quasi-extremist Muslims who advocate, propagate, and carry out fanatical activities in the name of Islam: the latter knowingly make use of Islam to promote anti-Islam values. It is the latter group that is against Islam. Perhaps they are the real enemies of Islam that the Ummah – both local and global needs to defend from. Joshua Woo Sze Zeng is the co-editor (with Soo-Inn Tan) of ‘The Bible and the Ballot: Reflections on Christian Political Engagement in Malaysia today’ (Singapore: Graceworks, 2011) and ‘Christianity and Citizenship’ (Singapore: Graceworks, upcoming). [i] Charles Kurzman, The Missing Martyrs: Why There Are So Few Muslim Terrorists(USA: Oxford University Press, 2011), 28, 30. [ii] Although PAS has its own Islamisation agenda it however has very little role in establishing the structures (such as those pointed out by Liow and Means – sources provided below) that have been enabling Malaysia to provide the “climate” for extremist activities. [iii] Joseph Chingyong Liow, Piety and Politics: Islamism in Contemporary Malaysia(USA: Oxford University Press, 2009), 155. [iv] Farik Zolkepli, ‘More Malaysia-trained extremists now involved in conflicts abroad,’ in The Jakarta Post, 11 July 2013, http://www.thejakartapost.com/news/2013/07/11/more-malaysia-trained-extremists-now-involved-conflicts-abroad.html (accessed 17 September 2013). [v] Joseph Chingyong Liow, Piety and Politics: Islamism in Contemporary Malaysia(USA: Oxford University Press, 2009), 160. [vi] Gordon P. Means, Political Islam in Southeast Asia (Malaysia: Strategic Information and Research Development Centre, 2009), 179. [vii] Patricia A. Martinez, ‘Deconstructing Jihad: Southeast Asian Contexts,’ in After Bali: The Threat of Terrorism in Southeast Asia, eds. Kumar Ramakrishna and See Seng An (Singapore: Institute of Defence and Strategic Studies and World Scientific Publishing, 2003), 74. [ix] Seyyed Hossein Nasr, ‘The Word of God: The Bridge Between Him, You, and Us,’ in A Common Word: Muslims and Christians on Loving God and Neighbor, eds. Miroslav Volf, Ghazi bin Muhammad, and Melissa Yarrington (USA: Wm. B. Eerdmans, 2010), 115. This entry was tagged 1Malaysia, Allah SWT, and love of the neighbour form a common ground upon which Islam and Christianity (and Judaism) are founded, anti-Islam, AUTHORITARIAN, “extremists” and “radicals”, ecofren, ecofren camelia, ecofrenmalaysia, extremists, Isaac, Ishmael, ISLAM, Jesus, klcc, kuala lumpur, love of Him, malaysia, malaysian muslim, Mempertahankan Akidah Ummah, Moses, Muhammad., ne God of Abraham, one malaysia community, radicals, SOCIAL UNREST, suicide bombing is ‘never justified’, suicide bombing is ‘often justified’, the Department of Islamic Development (JAKIM), the Unity of God, UMNO. Bookmark the permalink.